Yangshuo's Tai Chi Schools & Teachers - The China Taichi Guide is a Directory of Tai Chi Schools & Tai Chi Teachers in China. Yangshuo has played an important role as the cultural meeting place of East and West ever since it was first used as a show case beauty spot to entertain foreign presidents on their official visits to China. Backpackers followed on this trail and the town quickly became a centre where it was possible to try out Tai Chi for a few weeks along with every other aspect of Chinese culture. It was natural over time for this to evolve into larger scale teaching and so several schools have formed now around good Tai Chi practitioners. The area is a perfect setting for international students to put down roots for a month or so, all in all making it a great place to learn Tai Chi in China. 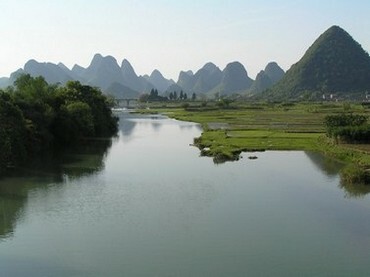 Please see About Yangshuo for more information on the area. The Yangshuo Traditional Tai Chi School is a Chen Style Tai Chi training centre in the lineage of Chen Zhen Lei. The teachers are Wu Heng Dong (Kim) and Wu Yu Ping (Ping), both of whom have practised Chinese martial arts since they were young. They offer a complete Chen Style training environment suitable for international students to progress from complete beginner to competition level. The China Tai Chi Guide is very happy to support their work. I helped create a Tai Chi training environment myself in China many years ago and for a while it was beautiful, with a warm, enthusiastic community of practitioners training together from all over the world. Wu Heng Dong and Wu Yu Ping have succeeded in creating the first school I have seen to match this and go further. I am really impressed with the quality of everything they are doing and the enthusiasm they are bringing to their work. Wang Zhi Ping has been teaching Tai Chi in Yangshuo for the past 20 years and has an attractive established school on private grounds close to Yangshuo Park. 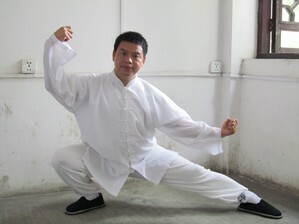 He is a dedicated Tai Chi practitioner and may be a good person to learn with especially as a beginner. The school has a health focus, not a martial one. The schools offers training in Simplified Yang 24, Feng Zhi Qiang's Chen Xinyi Hunyuan, the 5 Animal Exercises and several Qi Gong systems from the Shaolin Tradition all done in a soft way for health purposes. They charge 4000Y per month for studying at the school. Yang Dong Bao is a high level teacher of both Yang & Chen Xiao Jia Tai Chi living in Yangshuo, China. He teaches privately in the park or his studio. He prefers students who are able to commit to several months of study as Xiao Jia is not easy to learn and taking just a little on board is probably not useful for anyone other than senior practitioners. He is happy to offer beginner to advanced taichi practitioners short introductions to Xiao Jia taichi though, especially the finer details of peng, nu, ji, an. These elements of tai chi can be used as a health qi gong or as a way to deepen ones main tai chi practice. You may also be interested to train with Master Fu Neng Bin. He can be contacted here. 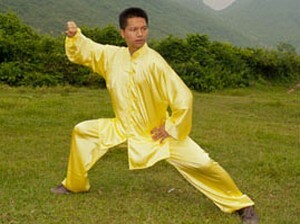 Likewise, Master Luo Mei Juan has also been teaching for many years and is well respected. Her school can be contacted here. The China Taichi Guide : An introduction to Yangshuo's Tai Chi Schools & Teachers. Why not learn taichi in a beautiful place - Yangshuo, China. 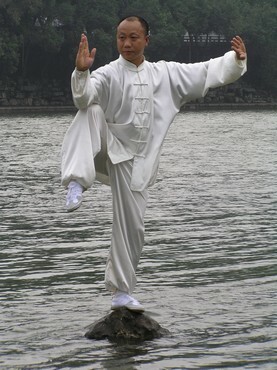 Yangshuo is an ideal environment for beginners to learn taichi.